THURSDAY, APRIL 18 - Gates open at 5 p.m. | First pitch at 6:05 p.m.
Yuengling Happy Hour: Fans can enjoy $3 Yuengling drafts exclusively at the Smith's Sausage Shack until the end of the sixth inning. 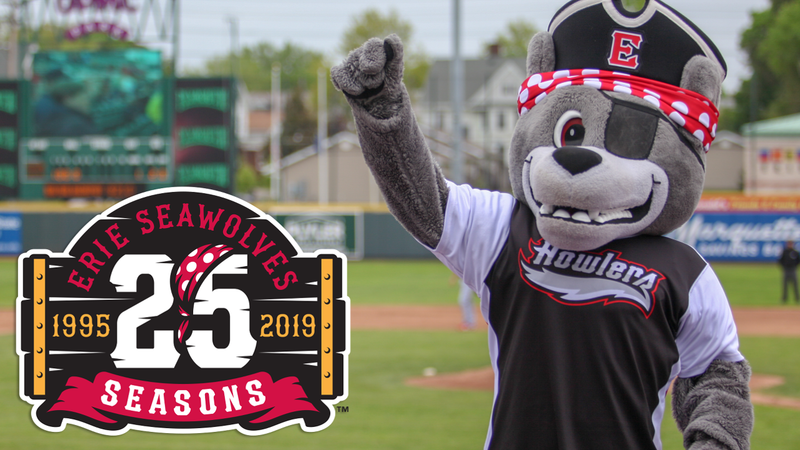 FRIDAY, APRIL 19 - Gates open at 5 p.m. | First pitch at 6:05 p.m.
Long-Sleeve T-Shirt Giveaway: Be one of the first 1,000 fans and receive a SeaWolves 25 Seasons long-sleeve T-shirt. Happy Hour: Fans can enjoy $3 specials on select domestic draft beers exclusively in the Bud Light Beer Garden until 6:05 p.m. Pre-game Autograph Session presented by Plyler Entry Systems: Before the game, meet C. Wolf and a SeaWolves player in the Team Store to get an autograph. Fast Play Friday: Fans 18 & older can listen for the Fast Play Friday keyword to text to win great prizes courtesy of the Pennsylvania Lottery. Allegiant Air Fly Away: One randomly selected fan will have the opportunity to catch three fly balls to win a flight on Allegiant Air, the Official Airline of Minor League Baseball. SATURDAY, APRIL 20 - Gates open at 11:30 a.m. | First pitch at 1:35 p.m. Kids Easter Egg Hunt: It's the biggest Kids Easter Egg Hunt in UPMC Park history presented by the Erie Catholic School System. All kids ages 12 and younger with a game ticket can participate. Over 10,000 Easter Eggs will be hidden around UPMC Park for kids to find. The Easter Egg hunt will begin promptly at 11:30 a.m. as gates open. MONDAY, APRIL 22 - Gates open at 5 p.m. | First pitch at 6:05 p.m.
Buck Night: Fans can enjoy Smith's hot dogs, popcorn, 12 oz Pepsi fountain drinks and select domestic draft beers for just $1 each thanks to Budweiser and Rocket 105. TUESDAY, APRIL 23 - Gates open at 5 p.m. | First pitch at 6:05 p.m. Kids Eat Free: The first 250 kids, ages 12 and under, receive a voucher for a free Smith's hot dog, Utz chips and Pepsi fountain drink thanks to 94.7 BOB FM. Two-Buck Tuesday: Fans 21 and older can enjoy $2 drink specials in the Bud Light Beer Garden through the sixth inning. WEDNESDAY, APRIL 24 - Gates open at 11 a.m. | First pitch at 12:05 p.m.
Businessperson's Special: Midweek matinees are a perfect treat to get away from your desk and catch some SeaWolves baseball. Enjoy a Smith's hot dog, Pepsi fountain drink and bag of Utz chips plus your game ticket for only $10. AAA Member Wednesday: AAA members can present their card to save $2 off any regularly priced ticket to this game.